I was looking at the Wikipedia page of the E-3 Sentry. It mentioned the IIAF had ordered ten E-3's in 1977 but were canceled in 1979, after the revolution. Now that makes me wonder what other a/c did the IIAF had on order at the time of the revolution? They had still to receive the last of the 80 F-14A ordered, which has been retained in the US. I don´t know about other combat assets. They might have had some more but I think they were about to start a modernisation of their Air Force, with the F-14 and F-16 to start with. 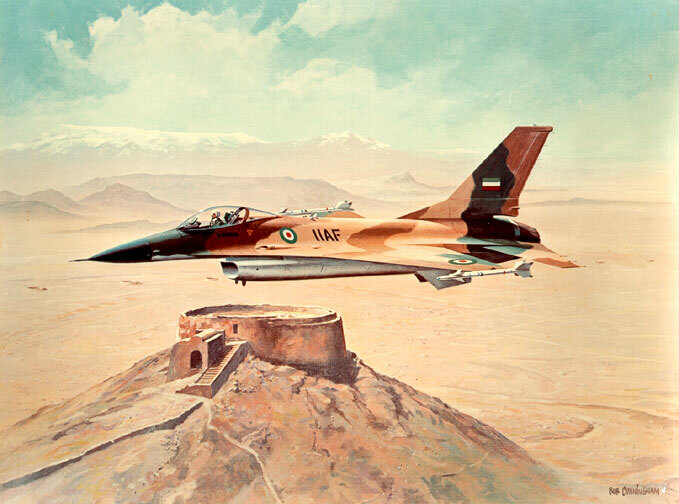 Pre-Revolution IRAN received a lot of F-4s and F-5s. These had all been delivered by 1979 I think. Not aircraft, however there was the hugely improved version of the British Chieftan tank, already sold to Iran in the 1970's. The new version had much improved mobility and the Cobham armour (given how sensitive the latter technology was, good job none of them reached Iran given what happened next). With a planned, all new MBT-80 seemingly dormant, this tank was adopted by the British Army as the Challenger 1, entering service in 1983. Italy had built four Frigates with were not delivered to Iran, then there was the US Destroyers, (the Kidd Class? ), which were put into US Navy service. They had a full complement of 1970's deliveries of P-3, KC707, C-130, UH-1, AH-1J, CH-47, F-14 (minus a couple), F-4, F-5, and had started F-16 training in Texas (Hill AFB). The Air Cav component is what is most interesting to ponder. I wonder how the pre-revolution Shah Air Force envisioned a need for such a massive cavalry force to be used (against whom). I think they also had AWACS on order. Arguably, the F-14/F-16 mix would have been the best hi-lo combo on earth in the early 80's. This was, certainly at the time, the most formidably equipped air power in the world as far as US equipment was concerned. If they already started training on the F-16, they must have been quite near to delivery. On the F-14, I see everywhere mentioned that 79 out of 80 were actually delivered before the revolution halted the deliveries. The last one has been delivered to the US Navy, I presume. You seem to be quite in the know, did they have any helicopters on order or more transport a/c. The last IIAF F-14 sat in storage for years at McGuire AFB, NJ before it was turned over to the USN as an attrition aircraft. Iran took delivery of 4 KC-747-100s and 2 B-747-200Fs. They were to get 2 more KC-747s, I believe that were being modified into tankers. All the KC-747s were ex-TWA aircraft. I don't recall what happened to the last two KC-747s. The B-747Fs were new builds and there were some that were not delivered. 747-2J9F cn 21668/ln 400 was being built for the IIAF when the revolution happened. It was stored, mostly-completed at Paine Field (I saw it there in 1983). In 1986 it was modified to a civil configuration and sold to Northwest Airlines. A friend of mine, who has flown it, tells me that it had an odd interior configuration. It was later flown by Kalitta Air and was scrapped in 2013. Here's a Grumman promotional video pre-revolution. If I'm not mistaken they did not become Kidd class destroyers until after the cancellation of the order as the USN had not ordered any on their own. The design was based on the proven Spruance class design with the anti-air capabilities of the Virginia class cruisers. The USN was more than happy to take them of course. They did acquire the nickname Ayatollah class in US Navy service. I had a friend in the ANG who was ex-Navy and had sailed on a Kidd-class. He said it was one of the better ships he was posted on (I think they had better air conditioners and dust filters). When they would sail through the Persian Gulf, the Iranians would taunt them over the radio: "Thanks for delivering our ship." "Please set course for port to deliver our ship." He also said that many of the hull sections had ID stampings in Farsi. Haha, it can't be denied that the Iranians have a sense of humor. I once did some acquisition cost comparisons for what data was publicly available. Note that assembling these kinds of costs is difficult and prone to lack of data, lack of knowledge about the bundled support/extra kit, and dynamic inflation rates. For what numbers I found, I normalized them to 1980 using an inflation calculator. In 1980, an F-5E would be about $2.7 M, an F-4E would be under $6 M, an F-14A would be about $18 M, and an F-16A would be about $7 M. The F-14A stands out in this era as a very expensive aircraft. Add in P-3s, 747s, a fleet of helicopters and ten (count them, ten) E-3 orders and you have probably one of the biggest defense acquisition programs in the 1970s. My question becomes: how was this all being financed? Iran was flush with foreign currency as a result of being an oil-rich exporting country during the oil crisis. I remember reading somewhere a long time ago that the Iranians were interested in C-5 Galaxies at the time of the revolution. Does anyone know anything about that? I wish I could remember where I read it. I vaguely remember reading too that the West Germans were interested as well OR that Lockheed had proposed selling C-5s to the Luftwaffe. OT: What should the West Germans use Galaxys for? They only had tactical transports, their Transalls. The third world war frontline would come too close for comfort by itself. Not sure why Iran or West Germany would have cared for C-5s. C-5s are for those few nations who want to reach around the world very quickly, which neither nation really cared about. However, I'm sure Lockheed salesmen tested the waters regardless. I'd be surprised if they didn't bring it up. Supposedly Iran offered, in 1974, $160 Million to restart the production line. This is documented in a book “the aviation history” by petrescu. I’ve read this also a few other places on the web, but again can’t really find actual documentation or the mission they saw a need for this plane. Moving armor around Germany in a Cold War scenario by air could have been considered, I suppose, but I doubt it. Oil, just like how the Saudis are financing all there new toys. Pre revolution Iran had the same position with the US that Saudi Arabia occupies today.